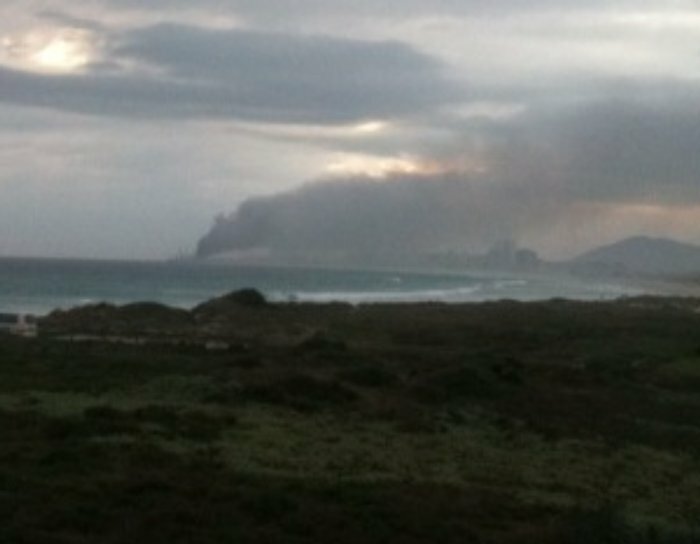 The cargo ship Seli 1 that ran aground off Blouberg Strand in September 2009 caught alight at 15:35 today (03/06/2010), sending vast plumes of smoke into the air, and officials have said there are no plans to extinguish the blaze. Twenty-two crew members were rescued from the ship after what was believed to be an accidental on-board fire. “They were taken to safety at the Table Bay harbour,” said Disaster Management spokesperson, Wilfred Solomons. Six members were suffering from smoke inhalation and there was one case of a back injury, he said. He confirmed that there were gas canisters on board. Theo Layne, station commander at the city’s Fire Control Centre said there had been an explosion on the ship in the afternoon, but could not confirm the time. While the ship originally held 300 000 tons of coal and 660 tons of fuel onboard, Layne could not confirm the current nature of the cargo or whether there was any coal or oil onboard the ship. However, he stated that there were flammable liquids on board, which they were using to “cut up shifts”. For this reason the rescue team was assessing the feasibility of boarding the ship to put out the fire. The South African Maritime Safety Association (SAMSA) said there should be no fire fighting action as the situation “could be dangerous”, and given that there were gas canisters onboard, the ship will be left to burn out. The team will only be able ascertain how the fire had affected the salvage after they had managed to either extinguish it or it had burnt out itself. The NSRI will be keeping vehicles and a rescuer on site as a precautionary measure. NSRI said the City and Disaster Management would ascertain whether the fire would be put out or be left to burn out. Solomons said environmental assessments were being conducted on the scene, however as of yet “no air pollution has been picked up”. The health department was also conducting checks.